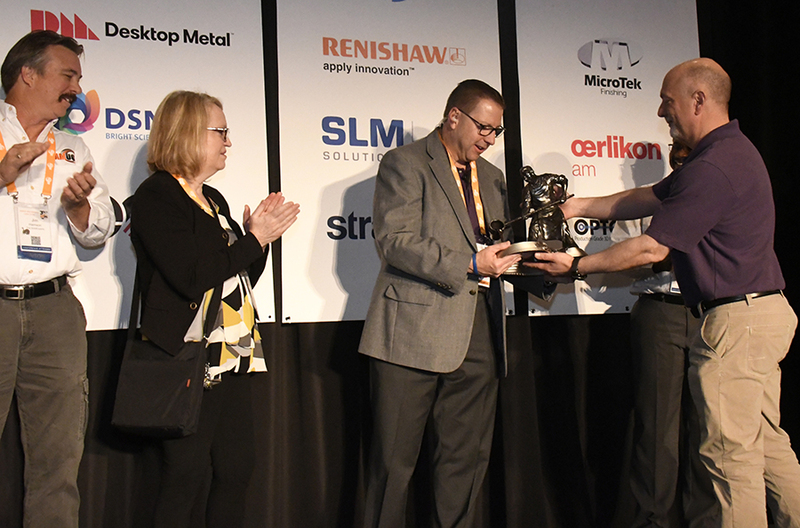 MILWAUKEE, WISC., May 10, 2018 – The Additive Manufacturing Users Group (AMUG) today announced Thomas Sorovetz as the first recipient of its Lifetime Achievement Award. Sorovetz, a casting engineer at Fiat Chrysler Automobiles and AMUG’s event manager, was recognized during the group’s 30th annual conference for 25 years of service, hard work and dedication. During the award presentation, Gary Rabinovitz, AMUG chairman and past president, noted that Sorovetz had served under 18 of the 23 AMUG presidents. From the stage, all of the past presidents spoke highly of Sorovetz’s contributions to the success of the group’s annual conference and to the financial health of the organization. Paul Bates, AMUG president, presents the Lifetime Achievement Award to Thomas Sorovetz. Also pictured: Suzanne Sorovetz, Thomas’ wife, and Jim Harrison, past president. Rabinovitz said, “During my two-year term as president, I spoke with Tom every day. Sundays, Christmas or Passover, it didn’t matter. If Tom had business to be done, he didn’t let holidays or weekends stop him.” Rabinovitz also noted that Sorovetz manages the biggest responsibilities yet is attentive to the smallest of details. “Tom negotiates the most amazing contracts with our conference venues. Yet during the conference, you will find him measuring a pool’s temperature at 4:00 AM or resolving a member’s hotel reservation issue. For Tom, it is all about hospitality and fiscal responsibility,” said Rabinovitz. Sorovetz is now the most honored AMUG member, being the only person to have received the three most prestigious awards that the group bestows: President’s Award , DINO (Distinguished Innovator operator) Award  and Lifetime Achievement Award . 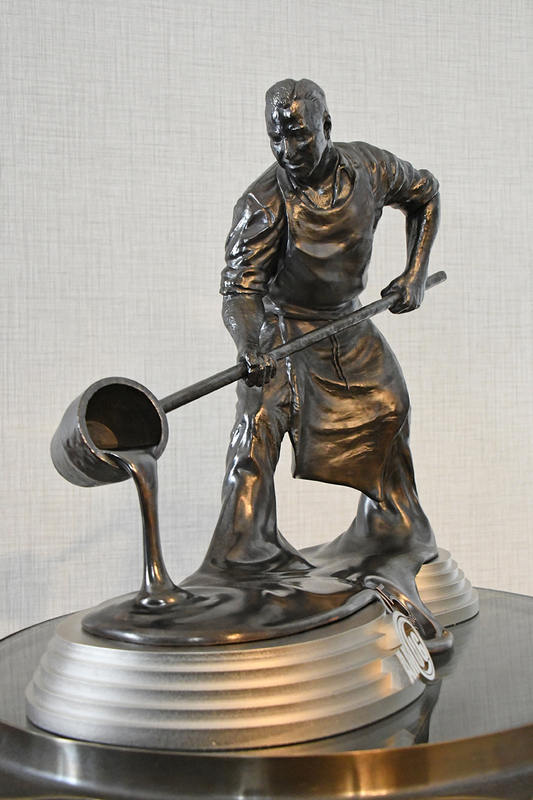 Created specifically for Thomas Sorovetz, the custom-designed award, representing his passion for foundry work, is personalized with his likeness, which was crafted from 3D scanning files. AMUG members banded together to fashion the original design, 3D print the award and embellish it with metal plating. These actions were completed by Jim Charmatz (Charmskool Design), CIDEAS Inc. and RePliForm, Inc.
Custom-designed Lifetime Achievement Award features Sorovetz’s likeness and highlights his passion for foundry work. AMUG is an organization that educates and advances the uses and applications of additive manufacturing technologies. 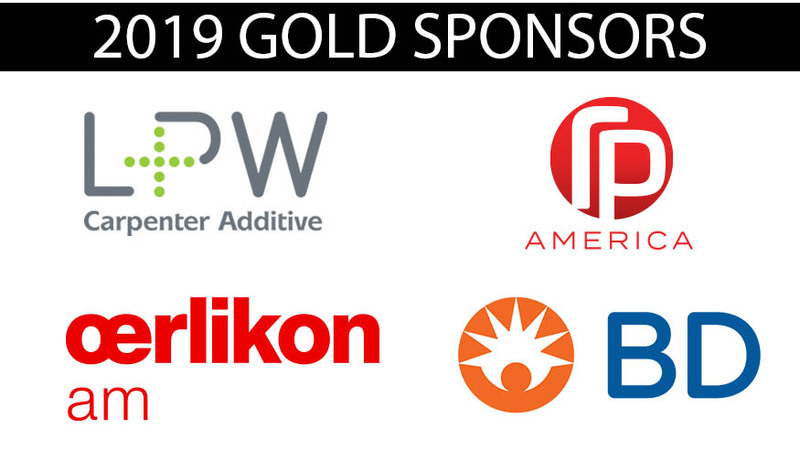 AMUG members include those with industrial additive manufacturing/3D printing technologies used for professional purposes from companies such as Stratasys, DSM Additive Manufacturing, SLM Solutions, GE Additive, ExOne, Renishaw, HP Inc., 3D Systems, Carbon, EOS, Formlabs, Desktop Metal and Additive Industries. AMUG meets annually to provide education and training through technical presentations on processes and new technologies. This information addresses operation of additive manufacturing equipment and the applications that use the parts they make. Online at www.amug.com.